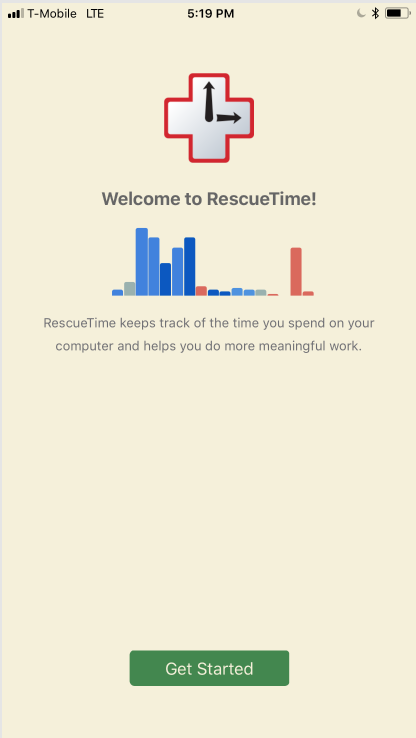 The RescueTime iOS app can be found at the App Store. Once you have installed the application, you'll automatically be taken to the app so you can start setting it up. Simply click the Get Started button. Enter the email address and password tied to your RescueTime account. If you don't have an account already, you'll need to create one. Just click on the Sign In link at the bottom of the screen. Upon signing in, you'll be asked to set your notifications. Clicking Allow Notifications will ensure that you'll be notified when you have met the goals you have set up. If you don't want to receive notifications skip this step. You can always turn notifications on later on by going to Settings and clicking on Notifications. 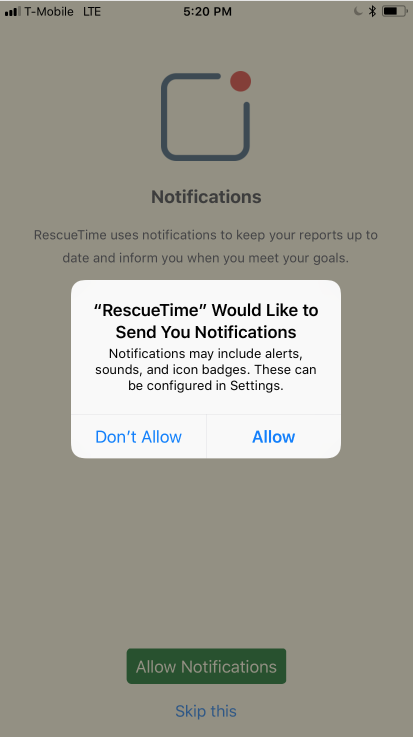 When you select Allow Notifications, you'll get a modal popup letting you know that RescueTime would like to send you notifications. Click Allow if you would want to move forward with receiving them. 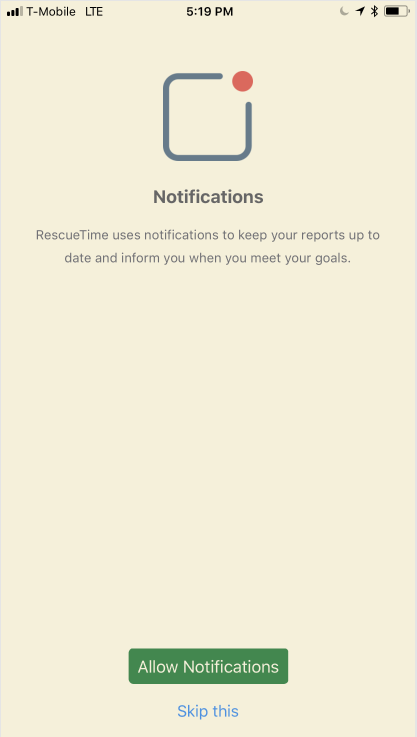 RescueTime uses your device's location to determine when you use your device, and the time you spend. To set time tracking on your device click Track This Device. You can Skip this if you don't want to set tracking. However, you can always change it later by going to Settings and selecting Location. Note that if tracking is not on you won't see any mobile time reported on your device or desktop dashboard. 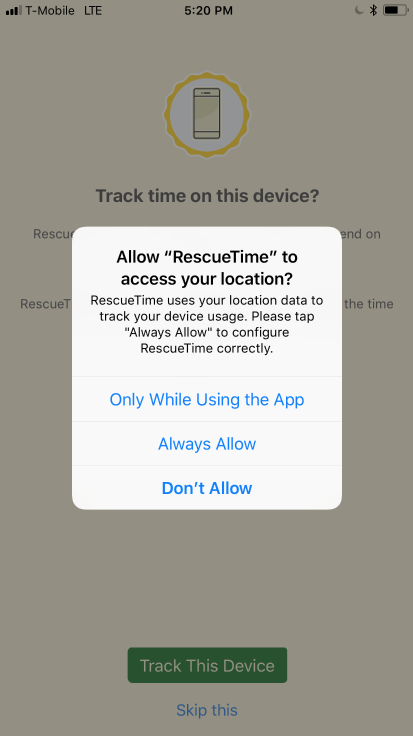 Your iOS device will want to confirm that you're allowing RescueTime to access your location. Setting it to Always Allow will ensure that all your mobile activity is recorded accurately. With the notifications and your location all set, you are now ready to start using the app. If you have an existing account that already has data, you will see it on the app's Dashboard under your desktop time. 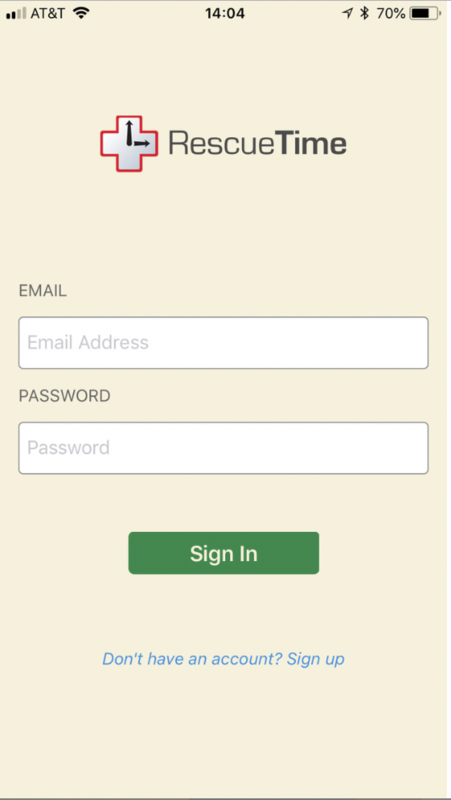 If you just created your account, it will take a few minutes for that data to be displayed. Mobile data might also not show up right away.